Comparing CoolSculpting and Laser Lipolysis – both are both noninvasive techniques which destroy fat cells. The results they offer are similar but the procedures themselves couldn’t be more different. CoolSculpting works by drastically lowering the temperature of fat deposits beneath the skin. Simply put it destroys fat cells by freezing them. Laser lipolysis (lipo refers to fat, lysis means to burst or destroy) relies on a high-energy laser device which rapidly heats fat deposits. It essentially melts fat away. Unlike CoolSculpting, laser lipolysis offers the added benefit of increasing collagen production for a firming, tightening effect. Unfortunately, it sometimes requires a period of recovery time due to the extreme temperatures involved. This period is seldom longer than a few days. 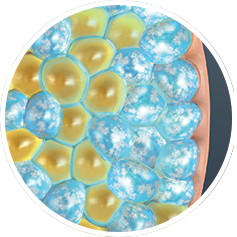 Once the fat cells are destroyed by either procedure they’re naturally reabsorbed by the body. This is a safe, gradual process which ultimately leads to a lean, toned final look. While not as dramatic as liposuction these procedures nonetheless offer excellent results. As mentioned above, both treatments are entirely noninvasive and therefore extremely safe. Neither are surgical procedures such as liposuction, and as such carry almost no risk of dangerous complications, other than cosmetic.